Here’s some quick facts about Farmed Salmon. What you choose to eat is a personal decision, but as with many things the facts are not readily apparent. Take a look at some of these points, and consider if this is the type of salmon you want to eat. More often than not farmed salmon is raised in cramped cages with little space to move. Sound familiar to low quality cattle or poultry operations? The salmon are prone to infection with sea lice and can thus infect wild salmon that swim past their cages. In fact in some parts of the World such as British Columbia, Canada and Norway the population of wild salmon is in decline. In British Columbia numbers of wild salmon returning to rivers have dwindled it is felt that farms at the mouth of the rivers are to blame. 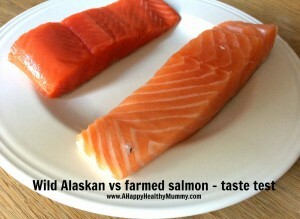 Farmed Salmon are treated with antibiotics and fed unnatural dietary supplements. The chemicals used to treat the sea lice can be poisonous and also have a negative effect on the crustacean (crab and lobster for example) population. Farmed salmon are artificial colored to prevent their flesh being a dull gray color. The many salmon farms exist to feed America’s insatiable appetite for salmon. So why not make the switch to choosing wild salmon and support the fisherman who care about the fish and the sustainability of the fisheries. I stopped buying/eating farmed salmon almost 2 years ago. If it’s not wild…it’s not on my plate. I’ve been working on my friends and family as well. Thanks for your opinion expressed in your reply and the link you sent. In some industries there are very few alternatives to mass-produced foods that is thankfully not the case with seafood, yet. It is our firm belief that wild and organic foods which are as untouched as possible by humans’ innate desire to “improve” the foods, or more efficiently raise live animals by consolidating them to confined quarters until butchered not only taste better but are healthier. This is a personal decision and we respect that other people may not care whether the foods they eat contain chemicals, have been genetically modified, or have been raised by eating by-products which they would not naturally eat in the wild.